A sapling grown from the tree that Anne Frank wrote about while in hiding planted on the Capitol's west front lawn. A sapling grown from the tree that Anne Frank wrote about while in hiding was celebrated Wednesday at the U.S. Capitol as a "living testament" to one of the Holocaust's most cherished victims, AFP reports. The small, leafy chestnut planted on the Capitol's west front lawn is a sapling grown from the original tree that entranced Frank outside the Amsterdam building where the famed diarist and her family hid from the Nazis during World War II. "It's fitting that we plant a tree in Anne Frank's memory in the shadow of our majestic Capitol dome," the building's chief architect Stephen Ayers said at a ceremony, according to AFP. "Years from now, visitors to the Capitol will find shade and solace in its mighty branches," he added. The horse-chestnut was one of the few images from the natural world that could be seen from the Frank's small hideout, where the family lived for two years. "Our chestnut tree is in full blossom," the girl wrote on May 13, 1944. "It is covered with leaves and is even more beautiful than last year." Republicans and Democrats joined dignitaries including Holocaust survivors and Dutch Foreign Minister Frans Timmermans in honoring the Jewish teenage girl whose writings have come to be known worldwide as symbols of hope, optimism, healing and rebirth. "This sapling, although tiny now, will permanently stand as a reminder for the ideals that Anne stood for," said congresswoman Debbie Wasserman Schultz. 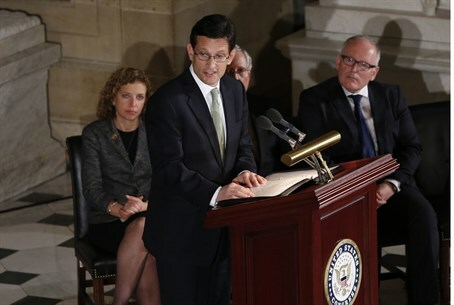 House Majority Leader Eric Cantor, who is Jewish, recited in English the "Shehecheyanu," the ancient Hebrew prayer that celebrates special occasions. "Today we dedicate this tree as a living testament to the memory of Anne Frank, a young woman of grand pleasantry and gifted insight, but who knew no peace," Cantor was quoted by AFP as having said. The sapling is among 11 created from the original tree, which collapsed in 2010. Several have been planted in the United States, including at New York's "Ground Zero." Yvonne Simons, executive director of Anne Frank Center USA, told AFP the Capitol tree was originally destined for the White House, but due to garden restrictions there it went to the Capitol grounds. In February, more than 300 copies of Anne Frank’s diary, publications containing biographies of her, and other related material were torn at many public libraries in Japan. In March, Japanese Prime Minister Shinzo Abe visited the Anne Frank museum in Amsterdam, where h described the vandalism as "regrettable" and noted the "deep connection" between Japan and the Anne Frank diary.